The mosque is composed of a large prayer hall unified under a single dome and an open courtyard to the northwest. It is oriented thirty-nine degrees east of south. An outer precinct, enclosed by a stonewall with windows, wraps around the mosque and court on all sides except for qibla. The elevation drops sharply towards the Bosphorus on the qibla wall side where a separate terrace and a royal kiosk were built on a partial basement. The mosque precinct has three gates on Sultanahmet Square (the former Byzantine hippodrome) and three gates along the northeast wall. The two side gates on the square are built with pavilions above the gate. Among the three gates to the northeast, the northernmost one leads into the madrasa-mausoleum complex, while the remaining two open onto a large site where the first Ottoman University (Dar’ulfunun) was built by Architect Fossati in 1854. The building, that in 1876 was appropriated by the Ottoman parliament and later the Ministry of Justice, was destroyed by fire in 1933; its site has been maintained as a public park. The third gate on this side is located next to the Koranic school, which abuts the precinct wall on the outside. The qibla terrace, composed of an inner walled garden and an outer deck which had rental housing, has a gate on either side with passageways leading down into the market street (arasta) and neighborhood below. A fire swept through the area in 1912, following which the market street was rebuilt; the outer deck is currently used for parking. Square. It is deep and has a stalactite semi-dome. Inside, a domed arcade frames the court on three sides and the mosque portico — with arches slightly wider and taller than those of the arcade – completes the gallery on the fourth side. The two side entrances are found on either end of the domed portico. At the center of the courtyard, in axis with the main entrance, is a hexagonal fountain. It is crowned by a pent roof raised on elaborately carved arches that spring from six marble columns; this roof has recently been replaced by a small dome. The columns of the arcade and the portico are also carved from marble as well as porphyry, and the floor is paved with marble tiles. The courtyard has two rows of superimposed windows — rectangular below and arched above — that are placed at regular intervals on all three facades, which are topped with a marble balustrade. A double-story gallery runs along the court on the exterior, with ablution spigots provided at its basement level. This narrow gallery, which has a slanted roof at the level of the upper court windows, is continued at a grander scale and flanks the prayer hall on either side where it is roofed with domes and barrel vaults, interrupted only by the projecting piers. The prayer hall’s main entrance is from the courtyard and there are two secondary side entrances. The main entrance is highlighted by the raised central portico dome, which bears a marble Quranic panel on its tall drum. Set in a niche with a stalactite semi-dome, the entry has a triptych foundation plaque. The prayer hall is a rectangle, slightly wider than it is long. Inside, it is spacious and open, with a focus around the tall central dome. 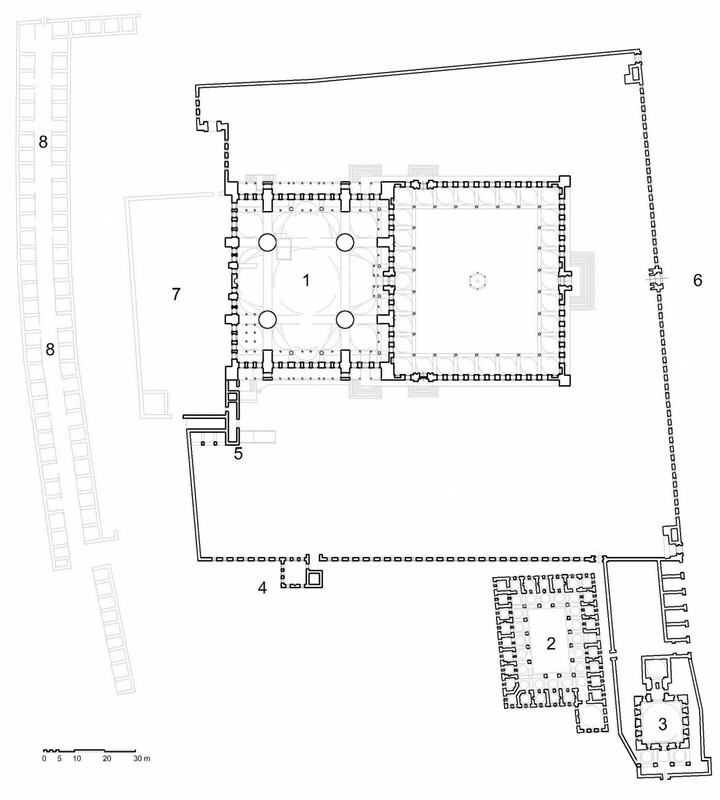 The dome sits on pendentives carried on four colossal piers or “elephant feet” that delineate the central court. Beyond the court, the space is extended by use of semi-domes and buttresses that transfer the lateral loads to piers set inside the walls. The central dome is surrounded by four semi-domes below its drum, which are wrapped by smaller semi-domes — three on all sides except for the qibla wall. The semi-domes are braced with buttresses on either side that are articulated with hipped roofs and domed turrets. This structural arrangement provides for a spacious and open interior and creates an effect of cascading domes on the exterior. The composition ends at the four corners where small single domes complete the pyramidal succession. The flow of space on the interior is uninterrupted except for a few functional elements. There is a muezzin’s platform elevated on columns in front of the southern pier, which has geometric patterns carved in its marble balustrade. An elaborately decorated wooden pulpit is set adjacent to the opposite pier. The royal lodge (hunkar mahfili), a screened platform raised on arches carried on precious marble columns, is located behind this pier and occupies the bay underneath the eastern corner dome. It is accessed from inside the mosque, as well as from the royal kiosk outside. An arcade, with balustrades at the balcony level, follows the entire length of the interior walls with the exception of the qibla wall. It is broken up into segments by the projecting structural piers and the supporting piers of the smaller semi-domes, which replace the arcade columns on their way down. The qibla wall has been differentiated in its design from the other walls to accommodate its special function. 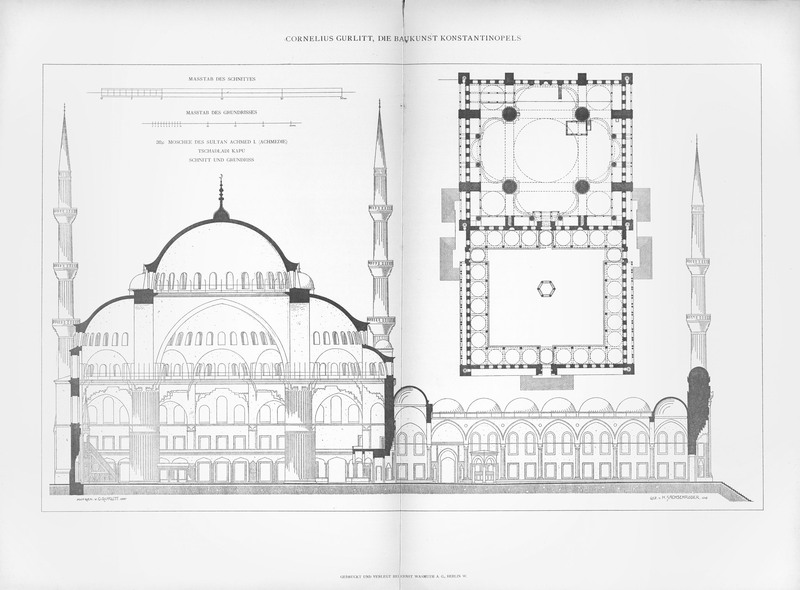 Where the peripheral extensions on three sides are covered with three semi-domes, the qibla recess is composed with two semi-domes on the sides, joining a straight wall in between, where the tall marble frame of the mihrab niche is positioned at the center. The piers supporting the structure, which project freely into the mosque interior on three sides, have been restrained along the qibla wall, resulting in a flatter but more subtly varied surface. A slender marble minbar rises along the pilaster to the right of the mihrab, and is crowned with a golden crescent above its conical cap. The mosque, named after its donor Sultan Ahmed I, has been donned the name “Blue” by foreign travelers based on the Kutahya tiles in dominant tones of blue, turquoise and green that cover most of its interior. The interior galleries have displays of tiles composed in panels at the balcony level depicting gardens with cypresses, flowers and fruit trees, but the most precious tiles have been used to decorate the royal lodge, which has notable jade and gilt work in its marble mihrab niche. Similar motifs, painted in gold and corresponding colors, adorn the multiple convex facets of the elephant feet above their marble bases, two of which are furnished with fountains. This rich polychrome complexion of the interior comes alive with sublime light flooding the interior from three tiers of windows on the walls and numerous others pierced into the domes: The central dome has twenty-eight windows in its drum and each of the four semi-domes has fourteen. Colored glasses on windows were originally imported from Venice, but have since been replaced with modern substitutes. The preacher’s pulpit, doors and window shutters display mastery of woodcarving and mother of pearl inlay of the period. The mosque holds many treasures, such as Quranic tablets from the hand of the renowned Ameti Kasim Gubari, while many others have been lost or placed in museums. The interior has been renovated several times, as early as 1837, and also more recently. 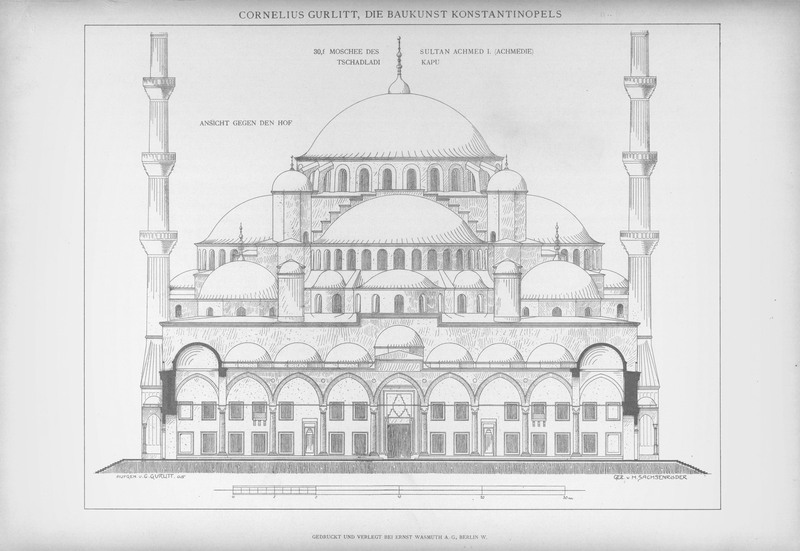 The Sultanahmet Mosque has the unusual feature of having six minarets, four of which rise from the corners mosque and two lower minarets placed at the front corners of the courtyard. The four around the mosque have three balconies each, while the courtyard minarets are furnished with two. All six minarets have fluted shafts and balconies with stalactite corbels. The northeastern minaret was restored in 1955. There is a royal kiosk (hunkar kasri) to the southeast of the mosque, which was rebuilt recently following destruction by fire. It features, for the first time in Ottoman architecture, the entry ramp, which allowed the sultan to enter the lodge mounted on his horse. The ramp leads up to a loggia with a view over the Bosphorus, with two retiring rooms on one side and a connection to the royal lodge inside the mosque on the other. Today, the royal kiosk is home to the Carpet and Kilim Museum (Hali ve Kilim Muzesi) that displays historic samples from mosques around Anatolia.